International efforts come with greater expenses related to travel costs, time costs, and the impact that cross-cultural work has on your own soul. Let’s just say that there is a price to be paid. So why go? Why take the time and pay the price to travel to Honduras or any place else for that matter when the hungry, the poor, the needy live right next door? Jesus Himself gave us a global mandate. He said GO to, “Jerusalem, Judea, Samaria, and the outermost parts of the world,” He was literally saying for us to go to our town, our country, neighboring countries and the furthest away places on the planet. At CONNECT GLOBAL we take this mandate very serious. We were formed as a Global organization knowing that the USA is part of the globe. Because of this, we will continue to travel to Honduras AND care for people here at home. Currently our primary efforts are based around building Aquaponic Feeding Systems. These sustainable, organic systems produce both Tilapia and fresh vegetables. They are environmentally friendly and easy to manage. Most importantly, they are virtually free to maintain and they feed people. We completed 5 Aquaponic Feeding Systems this past September in Cusuna, Honduras. 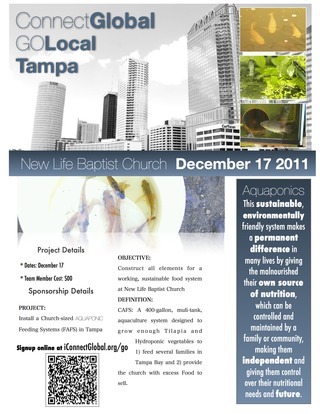 ON SATURDAY, DECEMBER 17TH WE WILL BUILD OUR FIRST DOMESTIC AQUAPONIC FEEDING SYSTEM IN TAMPA, FL, USA! Did I mention that we are super excited about this project? This system will be built on site at New Life Baptist Church in the Sulphur Springs neighborhood of Tampa. This is a very impoverished part of Tampa, often referred to as a “Produce Desert.” We are so honored to partner with this excellent church to make sure there will be Food in the House for hundreds of families. Here’s where you come in. Join us this Saturday. You can cut wood, drive a nail, or take picture. We will need help with all three. Share this story with your friends on Facebook, Twitter, or anywhere else you’re connected. Follow us on Facebook and Twitter @iConnectGlobal. Watch this story unfold at iConnectGlobal.org. Make a donation to help us continue this work and build more systems that will feed more people. In what ever way you can, get CONNECTED. New Life Baptist Church is located at 912 E. Fairbanks St., Tampa, FL 33604. We will begin at 10am. Stay all day or for just an hour. You can mail donations to Connect Global, PO Box 740273, Dallas, TX 75374 or online at www.iConnectGlobal.org.